"The Land of Kush Awaits You with Style and excitement"
A winding entryway with dome designs and wooden details beguiles revelers in this high-spirited Lower East Side lounge. Inside, the smell of flavored hookah smoke hovers overhead in the warmly lit main bar, through the maze of secluded alcoves and into the private VIP area. Young sorts sip exotic cocktails and groove to pumping rhythms, which naturally move from American pop to Middle Eastern hip-hop. This is no laid-back puff palace. The orange tones and bright beats fashion a den of secret trysts. The pricey hookah pipes, with flavors like mint and melon, come for $30. The rich tastes continue on the specialty drink menu with a fruity mango mojito and the thick chai martini, lightly spiced with cinnamon. A DJ energizes the space nightly, and appetizers such as chicken sliders, shrimp summer rolls, and baked shiitake mushrooms with goat cheese are served until late. Eat, drink and be merry for half the price Tuesdays through Fridays from 5pm to 8pm. Everything gets the discount--drinks, food and hookahs. 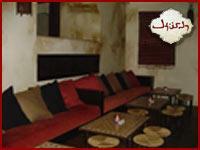 Call ahead to reserve a table in the sunken hookah lounge or private alcoves.